Monterey Bay, California to Punta Eugenia, Baja California. Santa Cruz Island, California. Photos: Scott Johnson. A large dark blue elongate species with yellow spots arranged in rows down the dorsum and in a row down each side of foot. Margin of foot and dorsum a lighter cobalt blue. Gills and rhinophores blue to black. 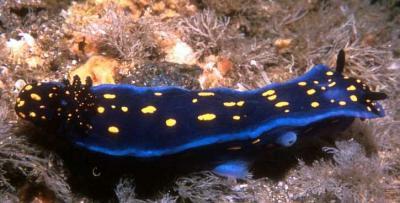 Similar in appearance to H. ghiselini but that species differs in having a darker blue background colour and smaller more numerous spots of yellow and white on the mantle and foot. There are also small white spots as well. There are yellow spots on the rhinophore clubs and the inside of the gills, and no paler blue margin. Grows to about 60 mm. Bertsch, H. (1978). The Chromodoridinae Nudibranchs from the Pacific Coast of America – Part IV. 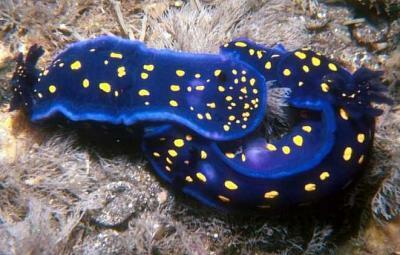 The genus Hypselodoris. The Veliger, 21(2): 245-247. Gosliner, T.M. & Johnson, R.F. (1999) Phylogeny of Hypselodoris (Nudibranchia: Chromodorididae) with a review of the monophyletic clade of Indo-Pacific species, including descriptions of twelve new species. Zoological Journal of the Linnean Society, 125: 1-114.